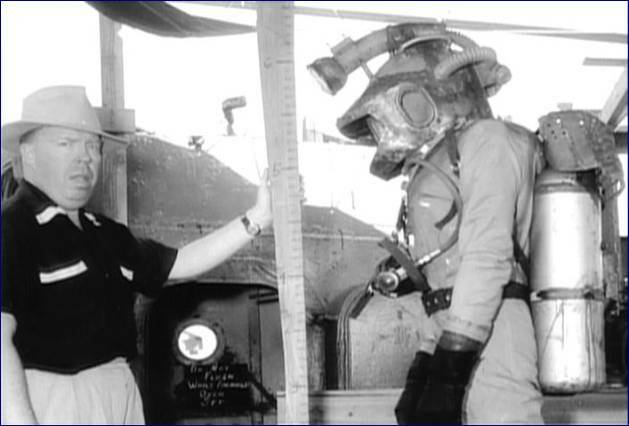 20,000 Leagues Production Designer HARPER GOFF poses with a makeshift measuring device alongside the Captain Nemo Diver, aboard the Disney camera barge on location in the Bahamas, 1954. 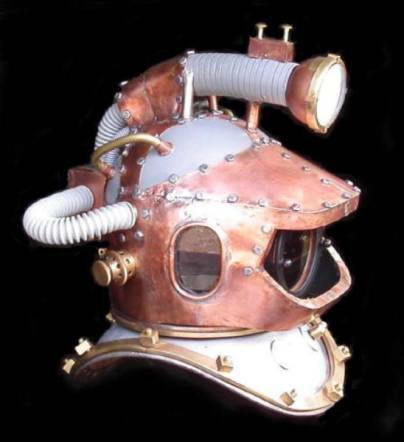 One of the problems in replicating the Nemo helmet comes from the fact that not all the graphic references are reliable. 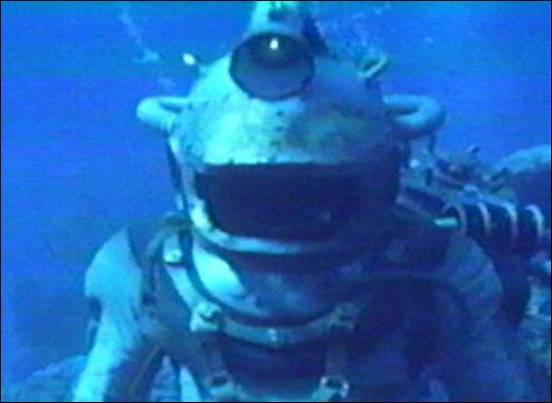 In many of the underwater sequences from the movie (like this screen grab) the image is distorted: squashed flat and wider than it should be. It’s more apparent if you stop-motion the DVD image, but if you look close at the picture above you can see how oval shaped the headlamp and front viewport are. The helmet is way too wide and flat, too. This kind of distortion can be misleading. 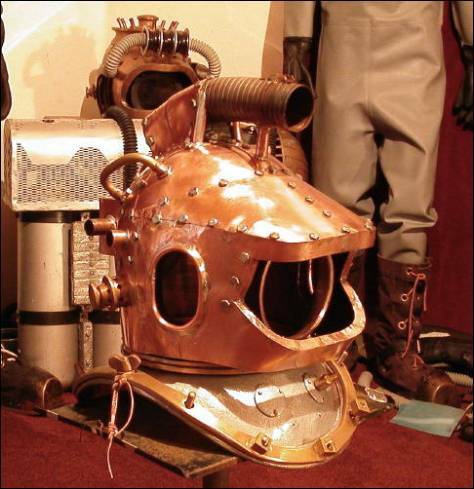 Additionally confusing is the fact that there were TWO Nemo helmets: the one used in the underwater scenes (called the “Hero” helmet) and a fiberglass version worn by James Mason in the dry and dry-for-wet scenes (the “Stunt” helmet), as shown above. Don’t be fooled! These two helmets were very different in appearance. 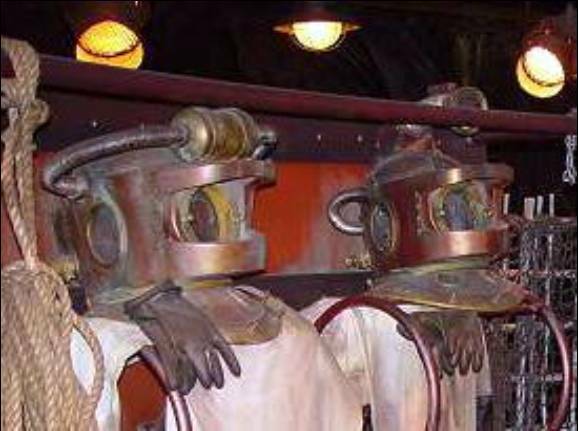 One might also be confused by Nemo helmets on display in Disney Theme Parks, like this one at EURODISNEY in France: fairly reminiscent of the real thing, but not really a faithful replica. Study these replica helmets on display at DISNEYSEA in Japan, and judge for yourself. And most recently we have the Disney 50th Anniversary Commemorative Miniatures. While they do include many the fine details (and then some: a 13-Bolt breastplate?!) they lack the proper shape and dimensions. 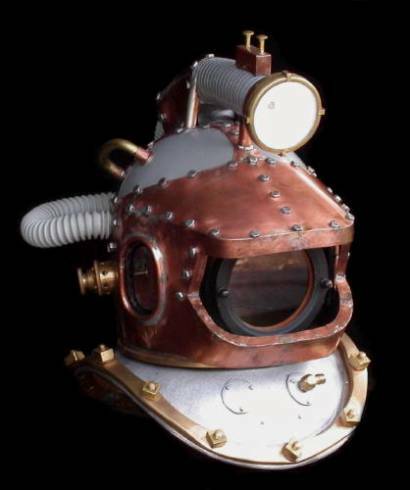 Most noticeably, the shape of the helmet itself is incorrect; the facemask and front viewport are much too wide open in the front; details like the hex-nut count and placement are inaccurate; the side-lites on the Nemo are too far aft; and on the Diver, the top visor seam lines are wrong. But don’t misunderstand: I think Vlad Petrov is a fine artist. Disney advertising says he used the original helmets as his reference. That might also mean he worked from photographs; and if he did, it could explain some of the inaccuracies. 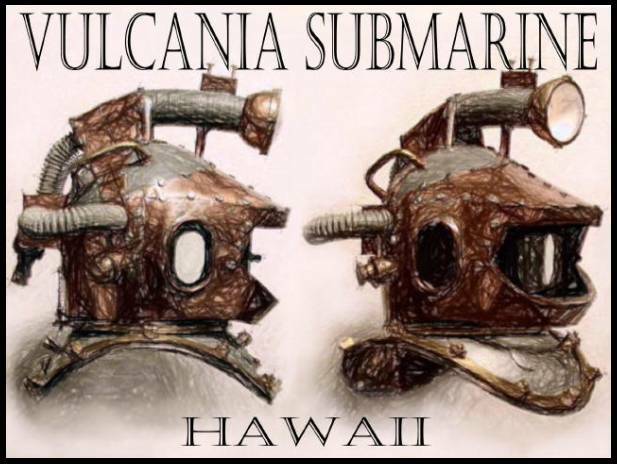 In any event, these helmets are just fine as miniatures; but it would be a mistake to perceive this as an accurate representation of what the real Nemo helmet looks like. 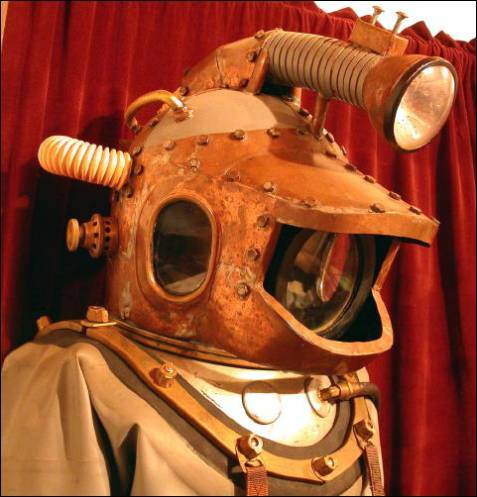 And in all fairness, even the helmet from my original NEMOSUIT left much to be desired. At the time, working with the references we had available, it was the best replica of its day, and we were pretty happy with it. But in light of the better graphics we have now, the mistakes I made are apparent. 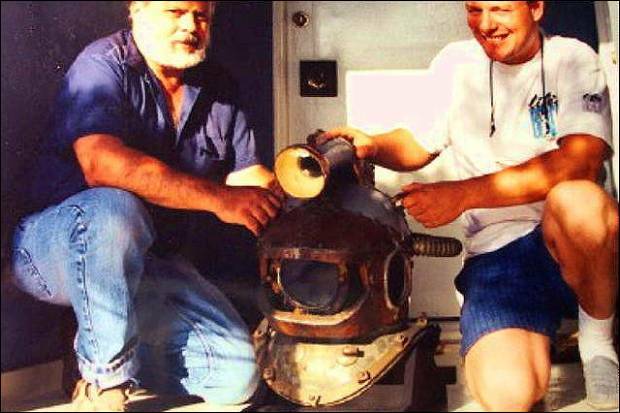 This image of Tom Scherman and Dan Kachur with the real Nemo helmet (photo taken by Dan’s wife and featured elsewhere on this website) also gives a pretty distortion-free idea of what the “Hero” looked like in more recent times. 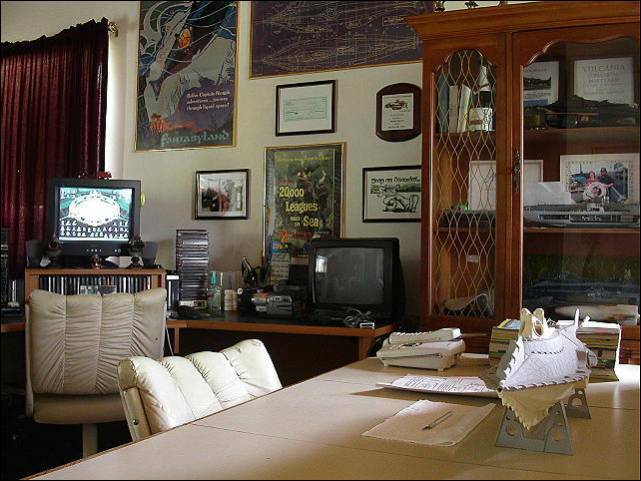 This is what we tried to recreate with the NEMO II. 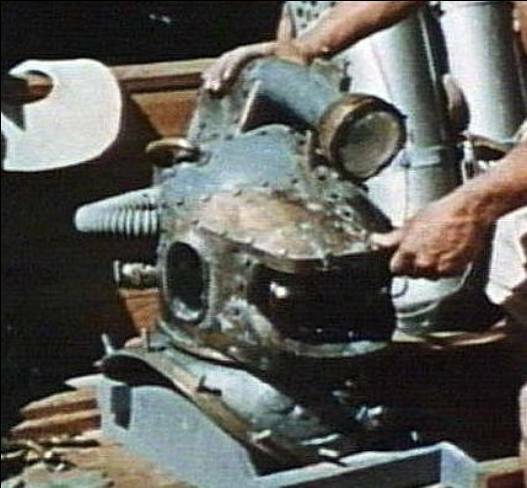 For the original Disney helmets, Goff started with a basic Asian pearl diving helmet: three windows, and no special adaptations for phone or spitcock. 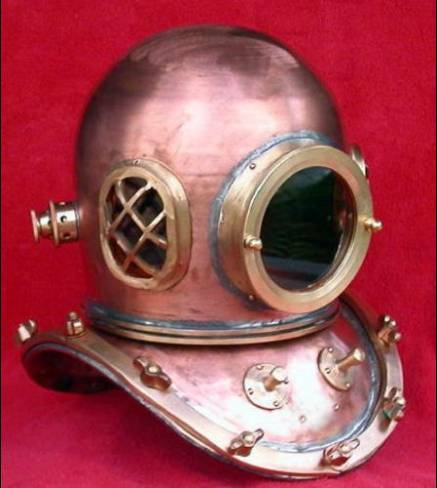 Likewise, we begin all our Leagues helmet projects with a brand new Asian pearl diving helmet. Then we start the process of modification. 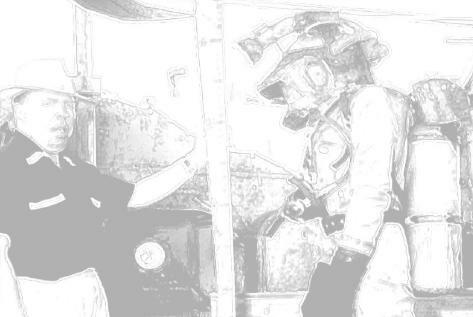 Much of the initial work involves studying the pictures of the original helmet on our computer, and using our graphics programs to develop the patterns our metalwork will be based upon. After the design is worked out, it becomes a matter of metalwork in the shop. 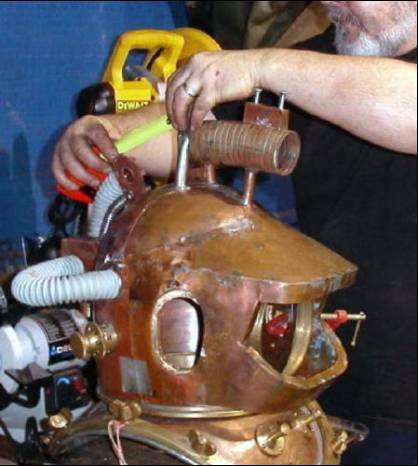 Here, I’m checking measurements against specs taken from diagrams made from photos of the Disney Nemo helmet. In this view, the metalwork is complete. The helmet has been scrubbed down with fine steel wool and lacquer thinner to remove the flux left over from the sweating process. 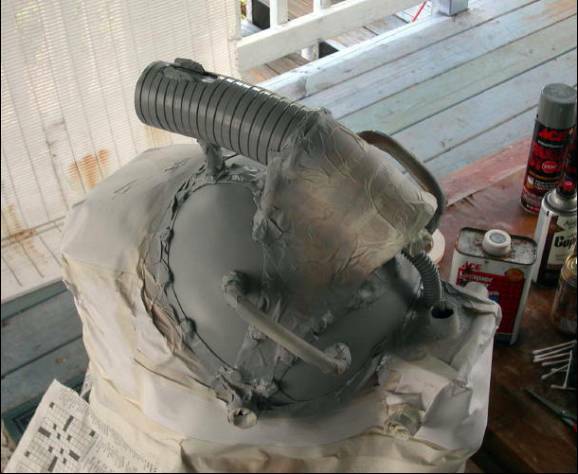 Then the helmet was acid-washed to clean the copper. 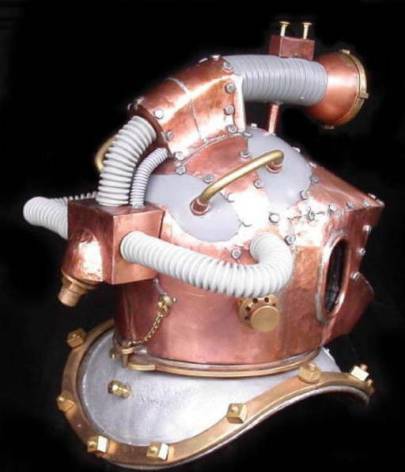 Unfortunately, the acid process also turns the solder black, so the helmet must then be thoroughly rinsed and vigorously scrubbed with SOS pads to brighten up both the copper and silver solder. When all the metal is bright and shiny like this, small imperfections like hammer marks in the copper, or areas where the solder shows (characteristic of the original) are apparent. (Time, weathering, and the wear-and-tear of actual use will take care of that.) Next comes the detail painting of the helmet crown area and headlamp flex tube. Three coats of primer are applied to prepare the surface. 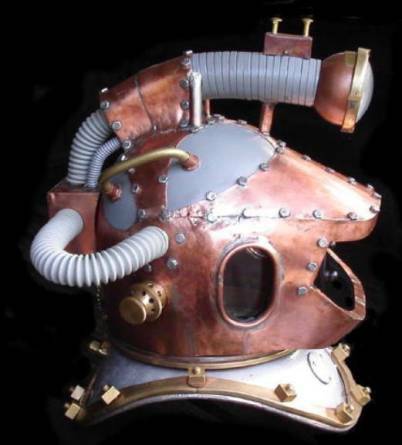 The copper of the helmet itself is fairly resistant to the elements, but is painted gray on the original; and, we are concerned about corrosion-protecting the steel flex tube of the headlamp assembly. 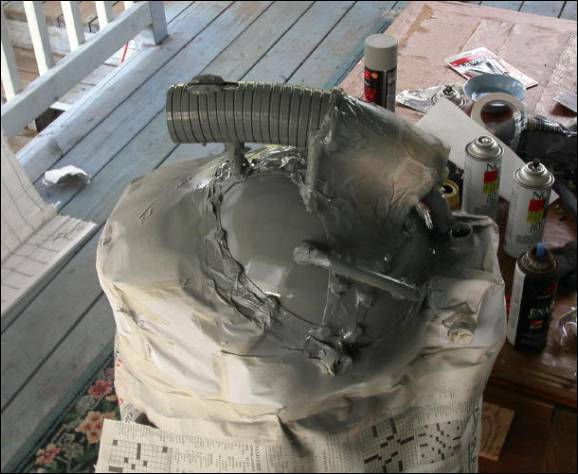 Next, because primer is not waterproof, three coats of gray enamel paint are applied to protect the metal. After they’ve dried, the paint will be lightly “distressed” with very fine steel wool to remove the unnatural shine and achieve an appearance authentic to the original. The finished helmet is set out in the sun for a photo op. The metalwork has received a light coating of Neatsfoot oil, which will aid in the patinization (browning) process, and cause minor dark blotches (fingerprints caused by the oil in human skin) to blend in more rapidly and become invisible. 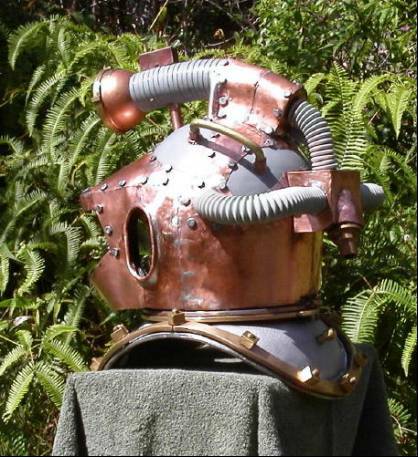 Note that, as was the case with the NAUTILUS DIVER, the faux air hoses are accurate reproductions of the now obsolete and unavailable vintage rubber SCUBA diving hoses used by Disney in 1954; not gas mask hoses as have been used in theme parks and on some surviving Disney helmets where the original hoses have long-since rotted away. Accurate to small details: note the emergency air fitting at the back of the breastplate; and the helmet keeper pin assembly at the back of the locking collar. These are found on all original Disney helmets, but were not originally part of our Asian helmet. 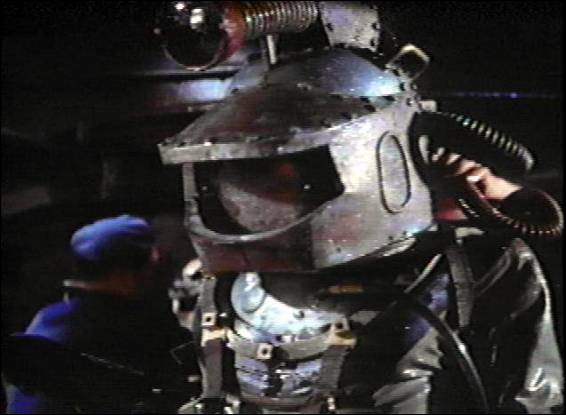 Also notice the smaller “flex tube” alongside the vertical air hose, running from the gooseneck box to the back side of the crown mount: presumably a duct for the headlamp wire, and true to the original Nemo helmet as seen in the movie. 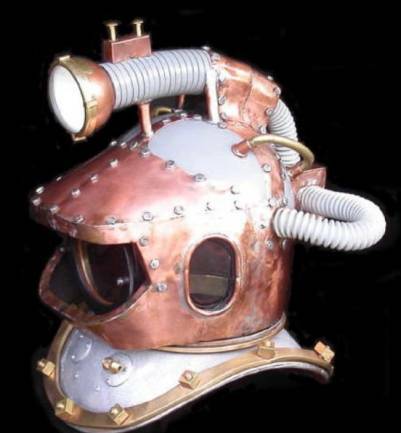 The headlamp on Disney’s original Nemo helmet was a façade: a hollow structure into which was placed a SCUBA diver’s flashlight. On the NEMO II, the lamp is fully operational: the bulb and reflector were removed from a 6-volt lantern; and the scratchbuilt reed switch is based on a 19th Century design. 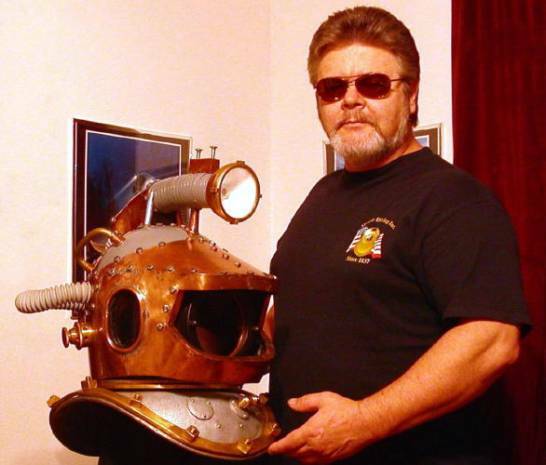 Pat Regan and the NEMO II helmet.